Been diving in North Horn? Please Vote! 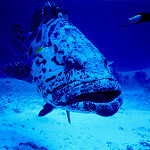 North Horn off of Osprey Reef is an exceptional dive that continues to impress. North Horn forms a natural amphitheatre with front row seats to an incredible shark show. Every variety you could wish to see in Australian waters is likely to be seen on the edges of this reef such as tiger sharks, white tip reef sharks, hammerheads and silver tips. The sharks appear in large numbers when feeding occurs, as do the ever-inquisitive potato cod. Common sightings of large dogtooth tunas have been reported. These pelagic fish can grow up to an impressive and intimidating 2.5 metres. They share the underwater space with rainbow runners, giant trevallies and mackerel. You may even be lucky enough to spot a majestic eagle ray which can grow up to 9m in length. If sharks and large game fish are your thing, then North Horn is certainly not to be missed. Easily one of the best diving locations on earth, the Great Barrier Reef is home to an abundance of incredible marine life, pristine coral reefs and unbelievable underwater beauty. For many, the Great Barrier Reef is at the top of their diving bucket list, and for good reason. Some of the many main attractions are Osprey Reef, Cod Hole and Ribbon Reefs and many divers choose to explore this natural wonder by liveaboard. Map of Great Barrier Reef, North Horn dive site.